Spring in Texas always seems to come early and time just slipped away. I can’t believe it has almost been two months since my last post. The biggest piece of news is I moved my hive from Sunshine Community Gardens down to Baab-Brock farms. After the hive got tagged last summer, there have been additional incidents of people deciding it would be fun to remove the outer cover. As a beekeeper, I felt it was my responsibility to remove this temptation from the public gardens so that no one ended up getting hurt. So last night, with the help of a fellow beekeeper Jim Hogg, we arrived at the gardens, got the hive taped up, and then wrestled it in the back of my truck. In prep for this move, I did harvest 16 medium frames of honey a few weeks ago to get the height and weight down. Even a hive with four medium supers is still pretty heavy and certainly not the most elegant thing to move. Here is a shot of it partially taped up. After I got the hive installed at Baab-Brock farms, I decided after all the jostling around, it would probably be wise to keep the hive taped up overnight. I got up early today to avoid rush hour and SXSW traffic and got the tape removed from the entrance. I even put some branches in front of the hive as an additional visual cue for the bees to fixate on their new location. Hopefully, they will enjoy their new location south of the river. Congrats! Was this the testy hive that needed requeening? How’s that coming along? No, this hive was always pretty sweet. I checked the other hive a few weeks ago and they are a lot calmer than they were last fall so hopefully this is due to the mellow Hawaiian influence of their new queen. I’ll probably check in on both hives now that they are at the same location this weekend to see how everyone is doing. 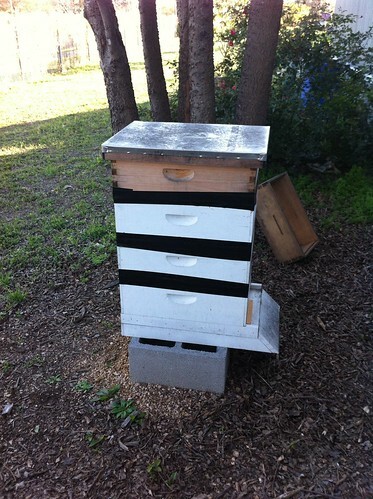 I think that I would have untaped everything but the upper opening, if you use one, and then uncover the main opening and get out of the way (when I used to move a hive, I tried to have it in place and leave it in the evening). The bees won’t leave, and that lets them start more naturally the next day. I have to admire your drive, however. I never attempted to move anything more than two deep supers. It was a pretty bumpy trip so I didn’t want the bees to come swarming out into the dark and get disoriented. Plus I came back the next morning well before sunrise to remove the tape. With beekeeping, some stuff is doctrinal, but a lot is a matter of technique. Half the time when i do something, I’m just glad when things seem to have worked out.